This insignificant memoir tells how its author attended the birth of West Germany's intelligence service—the so-called Gehlen Organization, which evolved into the Bundesnachrichtendienst. It will not achieve what I believe to be its goal: to help historians. It is too slight. The disjointed narrative does not clarify the evolution. The author does not anchor his statements with dates and documents. His sketches of personalities—the point of the book—are superficial. Historians will always have to go to the written record for the story. But this book will not flesh it out, as memoirs are intended to do. I blame the editors as much as the author. Why didn't they tell him—he died in 2003 but was alive when these fixes should have been made—what his manuscript needed? And they should have had someone who knows German check the bibliography. I know that publishers have financial pressures. But this simplistic work will not burnish the Naval Institute Press's escutcheon. James Critchfield fought in Europe in World War II as a regular cavalry officer. Afterward, he studied geopolitics at Columbia under an Army program to prepare men for occupation duty. He served in Germany and then in Austria, dealing with former Wehrmacht intelligence officers. In 1948, he left the Army and joined the CIA. He returned to Munich, where he helped set up a center to produce information on the Soviet Union. Gen. Reinhard Gehlen, who had headed the German Army's intelligence evaluation branch Foreign Armies East in the war against the Soviet Union, offered his files, his former personnel, and himself to the United States. Such an organization would enable the United States to hit the ground running in the important intelligence aspect of the Cold War. 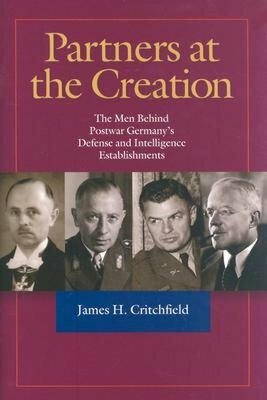 Critchfield relates the confused infighting of the setting up of the agency in a former Nazi compound in Pullach, its control by the CIA, and its evolution into a German agency with the establishment of the Bundesrepublik. Unfortunately, too much of what Critchfield offers are woolly generalities. For example, on p. 115, he writes, "Throughout 1949, Heusinger [Adolf Heusinger, later inspector general of the postwar German army] participated in an active and..